How to defeat Sobek in Assassin's Creed Origins' Trial of Sobek, the second Trial of the Gods. The second Trial of the Gods has arrived in Assassin’s Creed Origins, and this time you will be facing off against another god of ancient Egypt in the Trial of Sobek. Sobek is a gigantic human with a Nile crocodile head, but unfortunately no crocodiles to be seen during the fight! 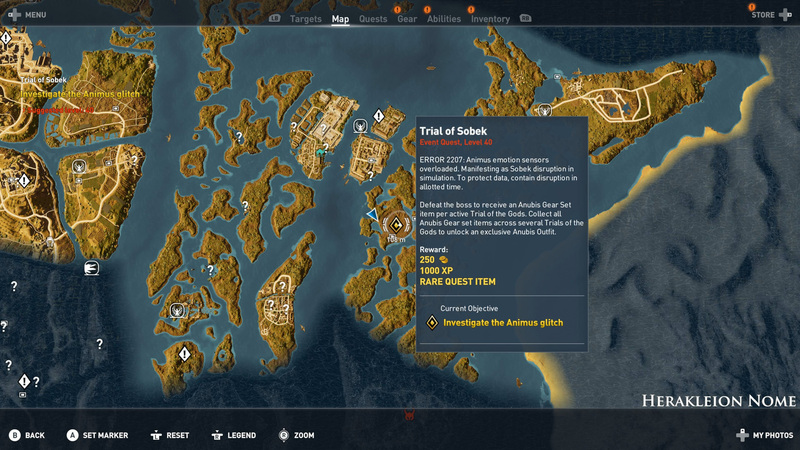 Found in the Herakleion Nome area of the map, the Trial of Sobek is a high-level boss fight, with a recommended level of 40. 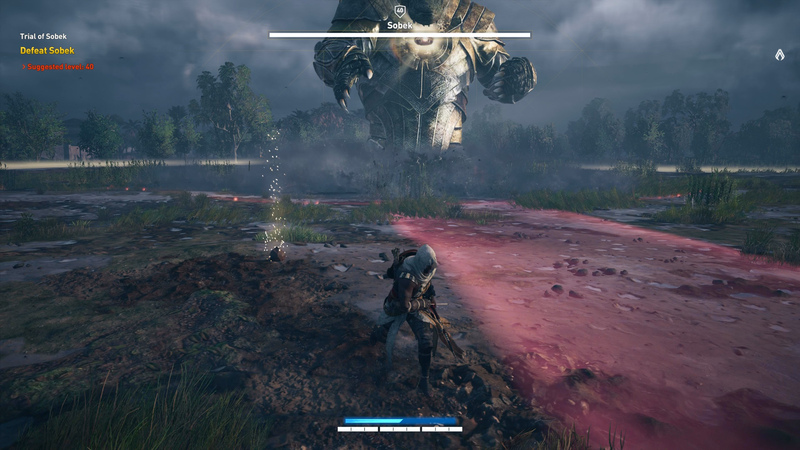 Though the recommended level is high, you can still attempt the fight at a lower level, however it will be extremely difficult and time consuming, as you won’t deal much damage and Sobek’s attacks are brutally strong. The Trial of Sobek plays out in a similar fashion to the Trial of Anubis, so come prepared with arrows, health-regeneration skills, and your fighting prowess. You can attempt the fight as many times while it's active, but once it expires, you won't see it until it returns in the future. Sobek will spawn in the middle of a circular arena, and won’t move from this position. Using your arrows, shoot Sobek in his chest, as this is his only weak point. While damaging Sobek, you will need to avoid his attacks and take down any extra enemies he summons. Mud Throw – Sobek will highlight a strip of the ground and cast out a wave of mud, damaging anything in its path. Mud Pools – Red circles will appear on the ground around you, and after a short charge, mud will erupt from the holes. Arrow Barrage – Sobek will highlight an extremely large area of the ground and fire a barrage of arrows at you. Either dodge several times to leave the area-of-effect or simply hold up your shield while facing Sobek to avoid the damage. Sobek Soldiers – Soldiers and a heavy lieutenant will be summoned to attack you. 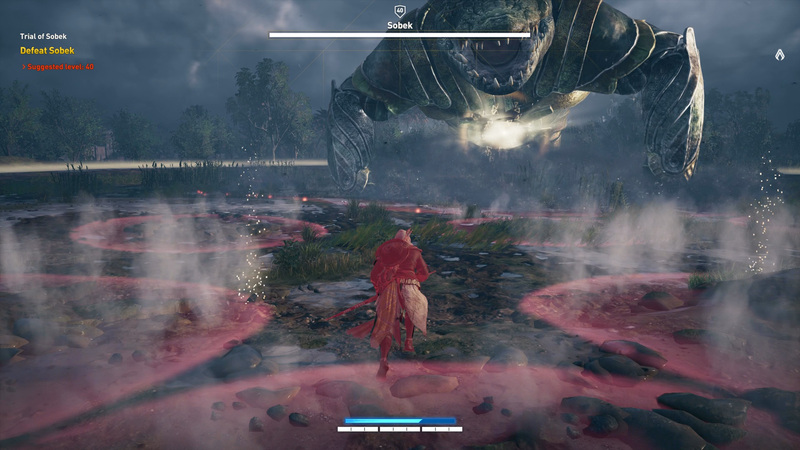 After avoiding Sobek’s attacks, dispatching the soldiers, and dealing enough damage, you will have successfully completed the Trial of Sobek quest in Assassin’s Creed Origins. If you’ve already completed the Trial of Anubis, you will receive the Was Sceptor for your troubles. This long-reaching weapon offers increased combo multiplier, higher critical hit rate, and health on critical hit, perfect for those who like to keep their enemies at a distance. With the Trial of Sobek complete, take some time to finish all the Align the Stars puzzles and hunt down all the tombs in Assassin’s Creed Origins!